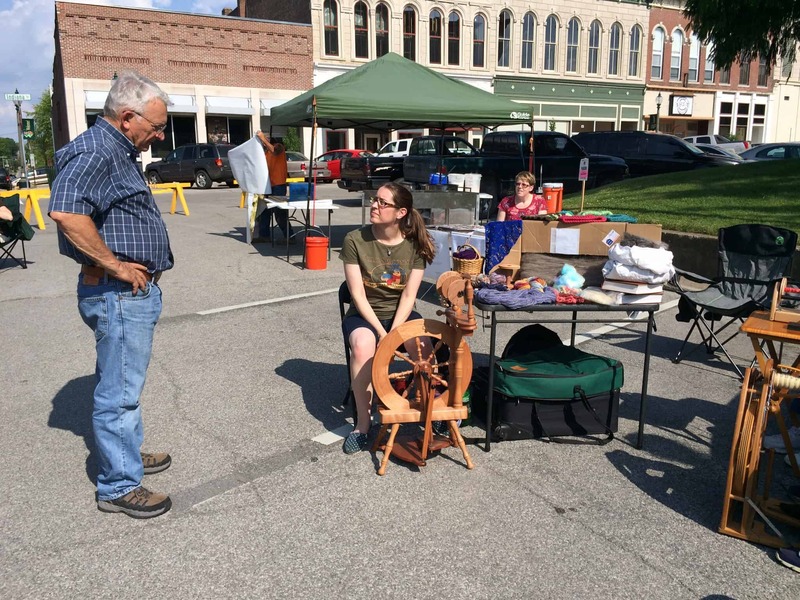 Last year, I attended The Fiber Event in Greencastle, Indiana. I planned to attend this year also, but then Chris and I got to go to India. The trip to India was at the same time as The Fiber Event 2015. My primary reason for going to Greencastle is to visit my good friend Stacy, who moved there a couple of years ago. 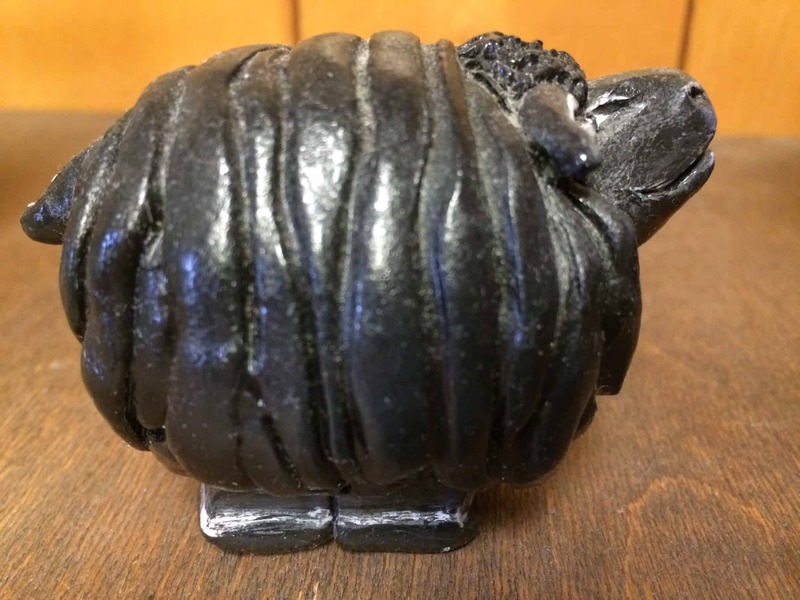 We put our heads together to come up with a new date, and discovered the Hoosier Hills Fiber Festival (a separate blog post is in progress; I’ve got to take pictures of my purchases), held about an hour from Greencastle on the first Friday and Saturday of June. I changed my tickets from April to this past weekend. I arrived in Indiana on Thursday afternoon and flew home Sunday evening. Stacy was working on Thursday and Friday. 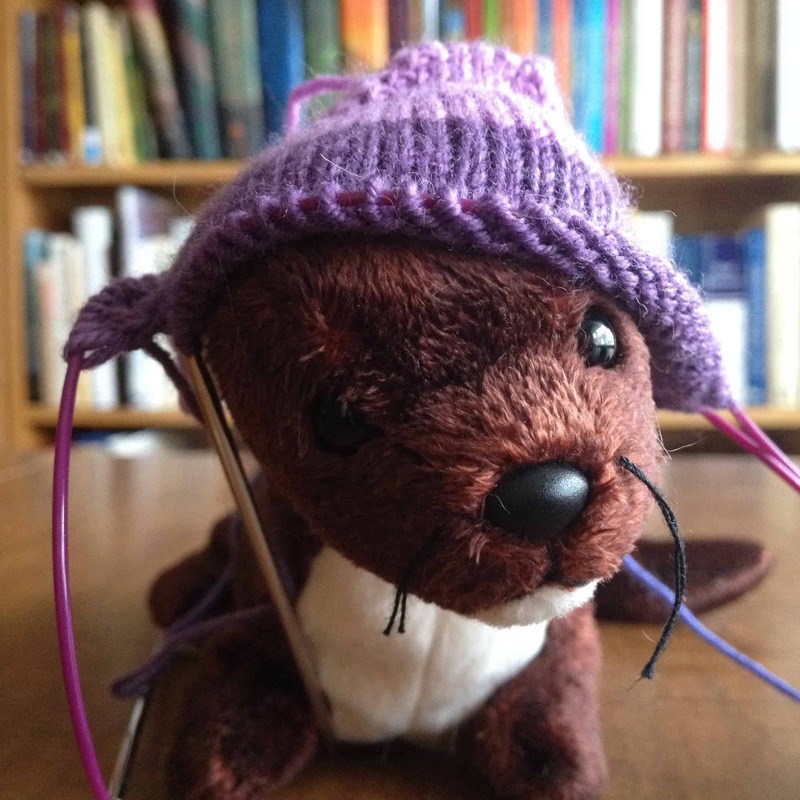 I spent most of my time, hanging out in her office, knitting. 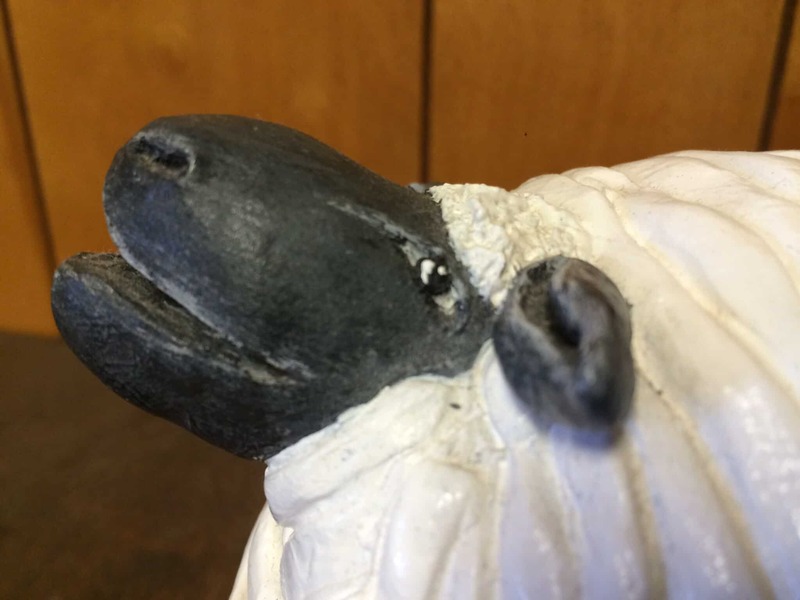 She has these adorable sheep sculptures in her office. I especially love their happy little faces. Stacy did attend The Fiber Event 2015. 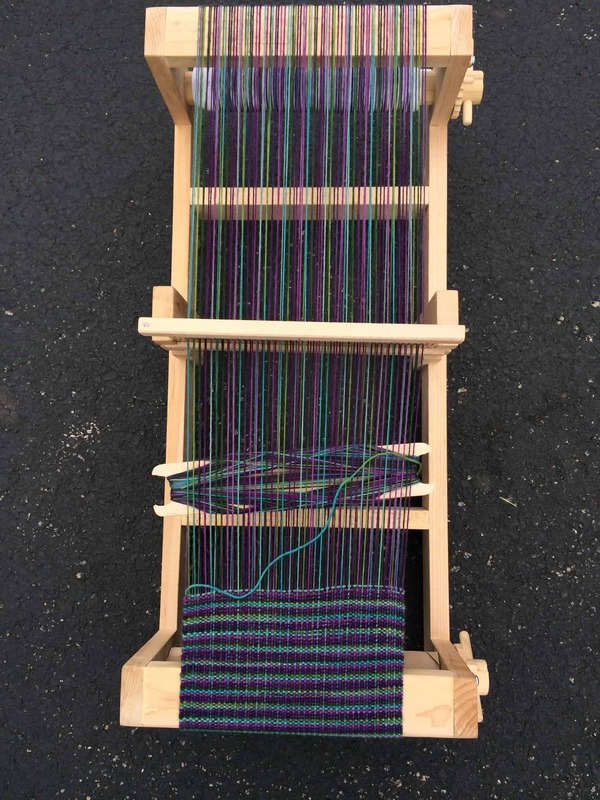 Her mother bought her an early birthday present: a 10″ wide rigid heddle loom from Couch’s Little Workshop, an Indiana-based family business of handmade looms. Stacy had not warped the loom yet and wanted to do so before we went to the Hoosier Hills Fiber Festival. Couch’s Little Workshop was going to be at that Festival also, and she wanted to ask them questions or resolve any problems she might have with the loom. On Thursday night, I taught her how to warp the loom and how to weave. 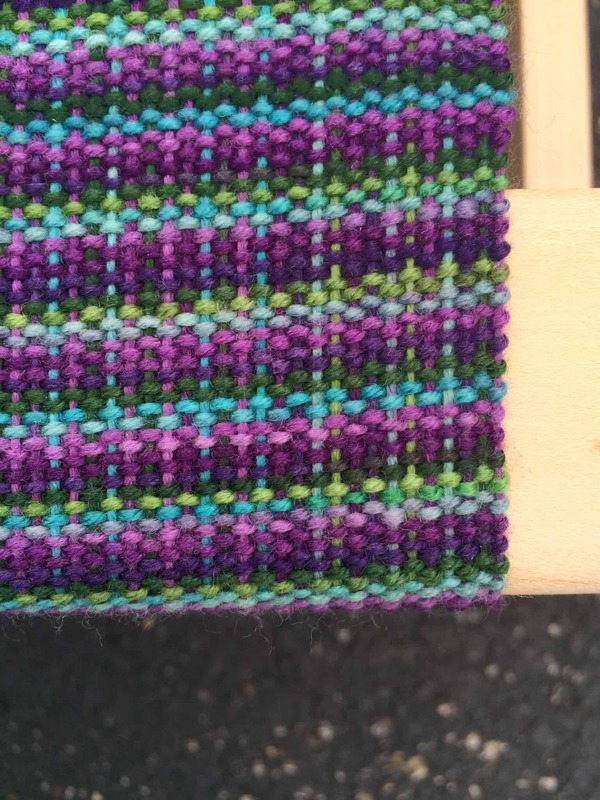 Stacy took a three-hour rigid heddle weaving class two years ago, at The Fiber Event, but she hasn’t woven anything since then. Her selvages are spectacular! 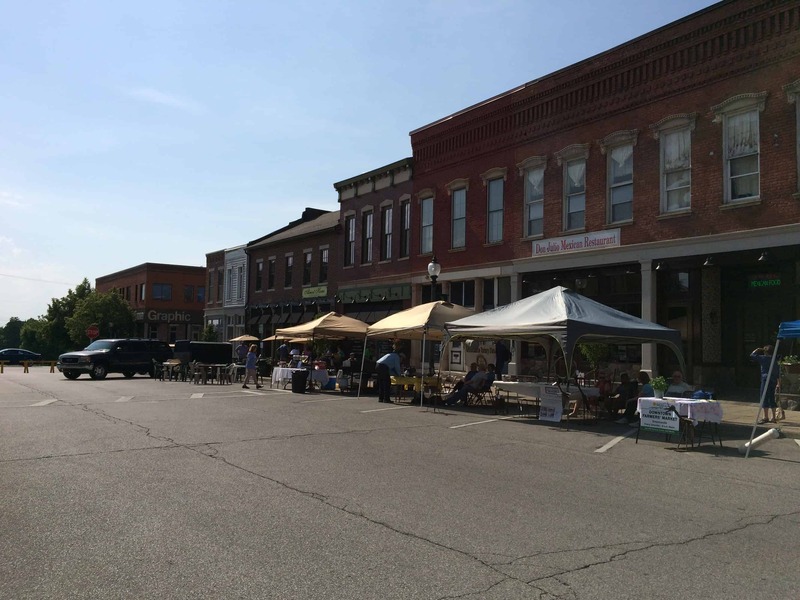 During the spring, summer, and fall, Greencastle has a “First Fridays” program. 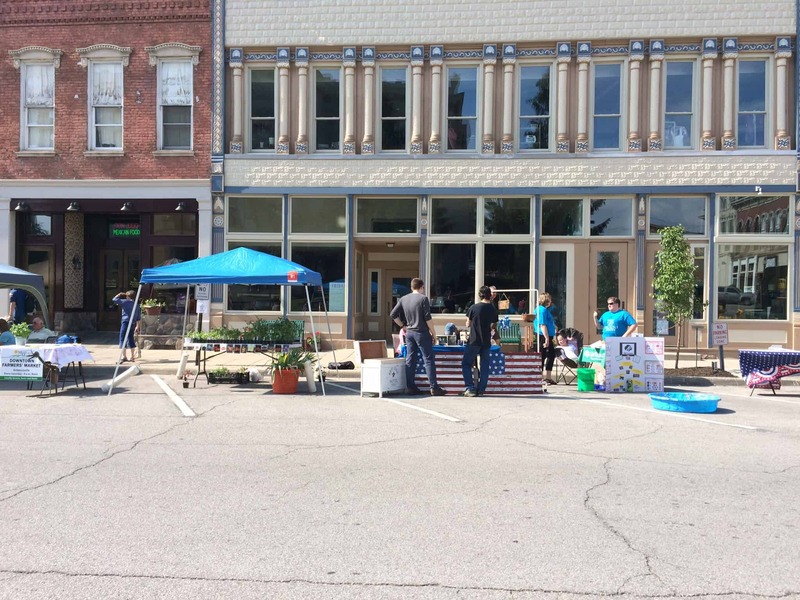 The downtown business group, of which Stacy is President, helps to organize First Fridays. The town closes off a road next to the courthouse. Vendors sell their wares and there’s music on the steps of the Courthouse. 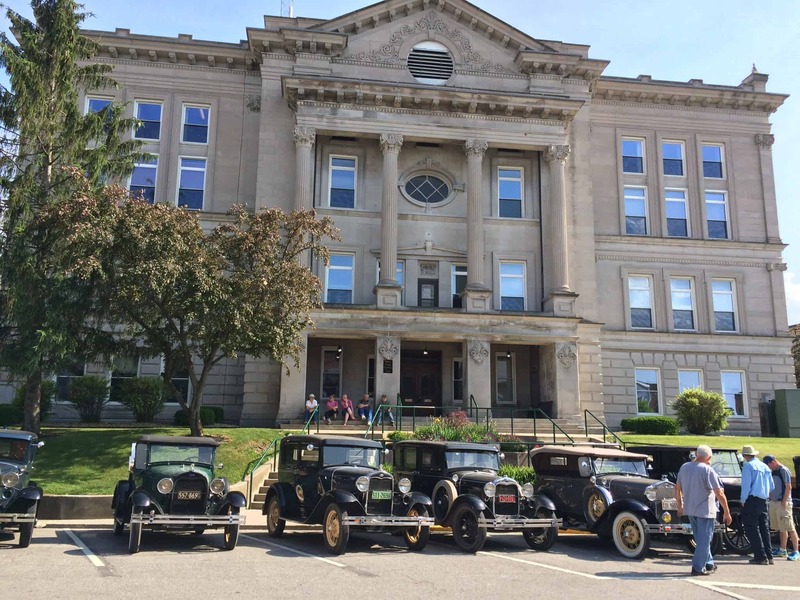 This month, a vintage car club came for the event. 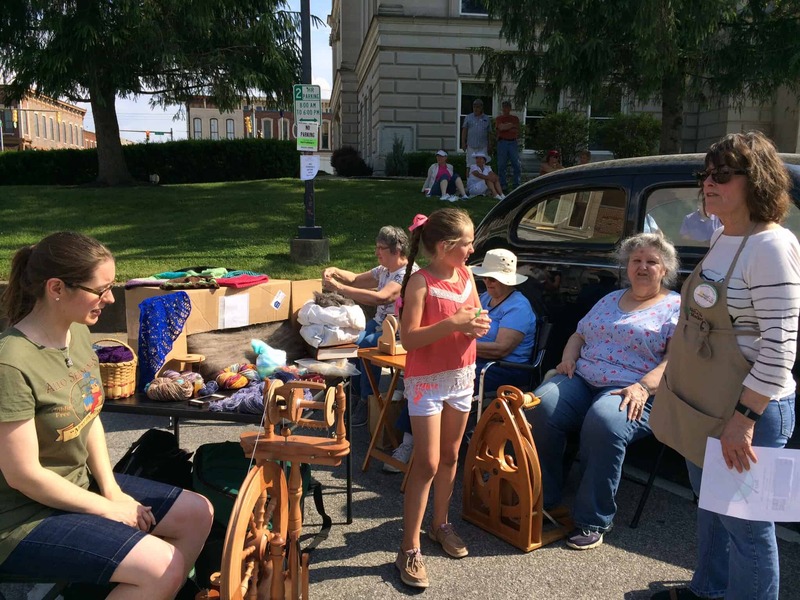 Several local clubs and civic groups attended this month also, including the Putnam County Spinners Guild, of which Stacy is a member. I helped set up and take down the tables and chairs for the Guild. 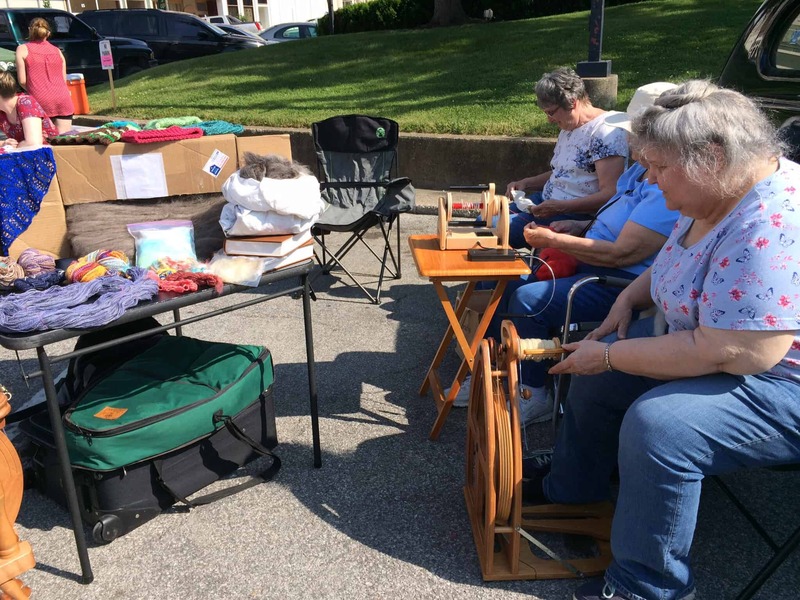 The original plan was that I would finish spinning the Cormo and bring the bobbins with me so I could ply them on one of Stacy’s wheels during the event. I didn’t get the spinning done, so I knit instead. The fiber in the box is llama that Stacy recently got back from processing. The fiber in the white bag on the right is unprocessed llama. The yarns on the table are all handspun. The full-size hanks are Stacy’s handspun and I believe they are all Nerd Girl Yarns fibers. 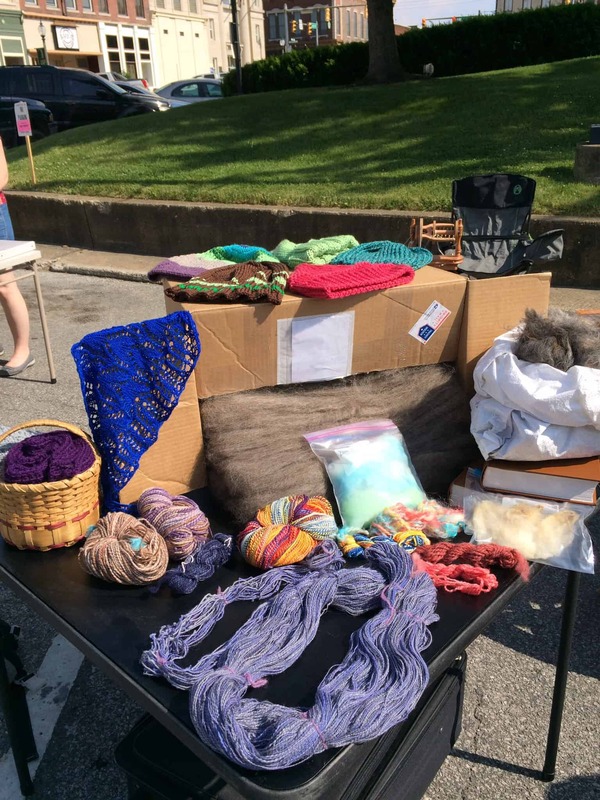 The smaller samples were handspun and dyed by another Guild member. Guild members Sarah (spinning with a Turkish Spindle), Joy (spinning with an e-spinner) and Mary (spinning on an Ashford Joy wheel). Stacy chatting with a visitor to the Guild’s space. The girl in the middle of the picture came back to the Guild space several times during the event. She went to each spinner and asked questions about the method each was using. 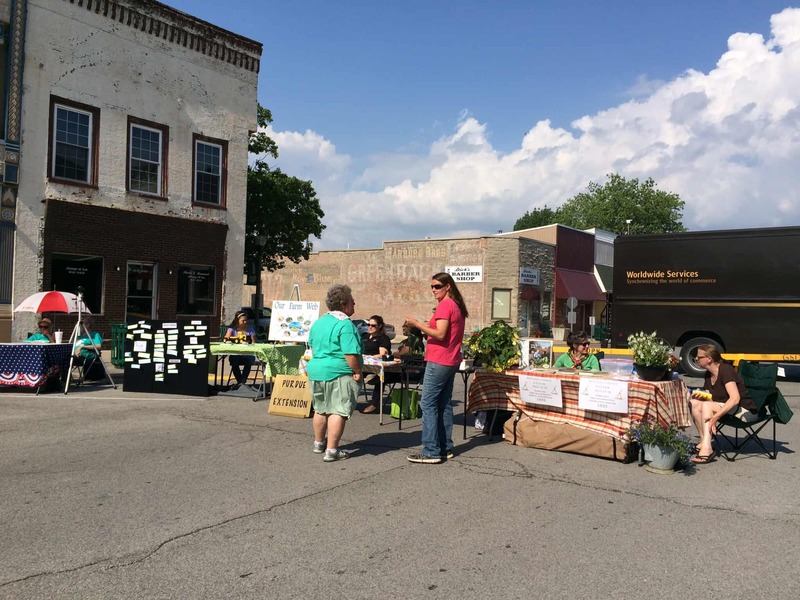 The weather was perfect for this First Fridays event, though the sun was so bright that we had a hard time looking at people while we talked to them. Stacy’s boyfriend, Lance, came to our rescue with Florida Gators baseball caps! The vendors and tables part of First Fridays was from 5 to 7 pm. 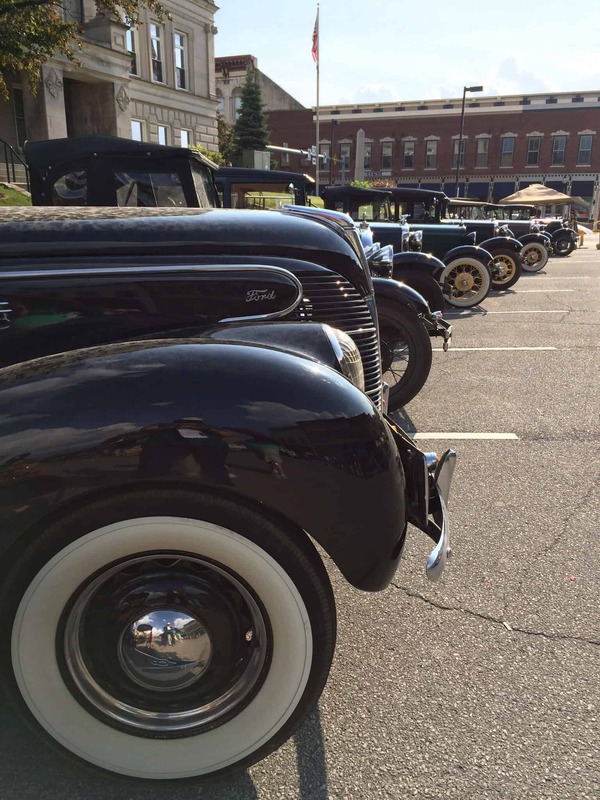 We were going to stay for longer, but we had to move out of the way for the Antique Cars to leave, so packed up shortly after 7 pm. The music continued until late, so after packing up we stayed and listened to music, and I got to meet several of Stacy’s friends. It was a wonderful evening! The prompt for today is to take creative pictures. 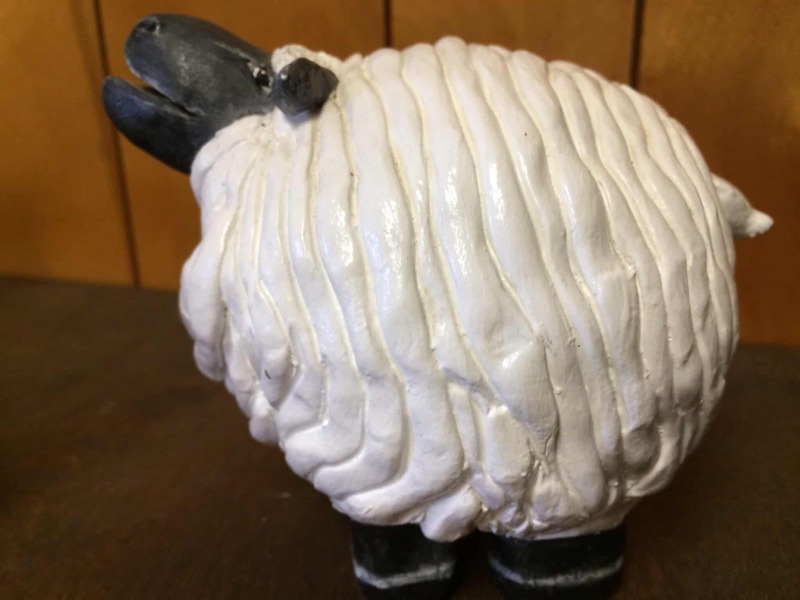 On this blog, I usually use straightforward pictures. However, I often take creative pictures of the pieces for fun or to include in homework submissions for the Harry Potter Knitting / Crochet House Cup. 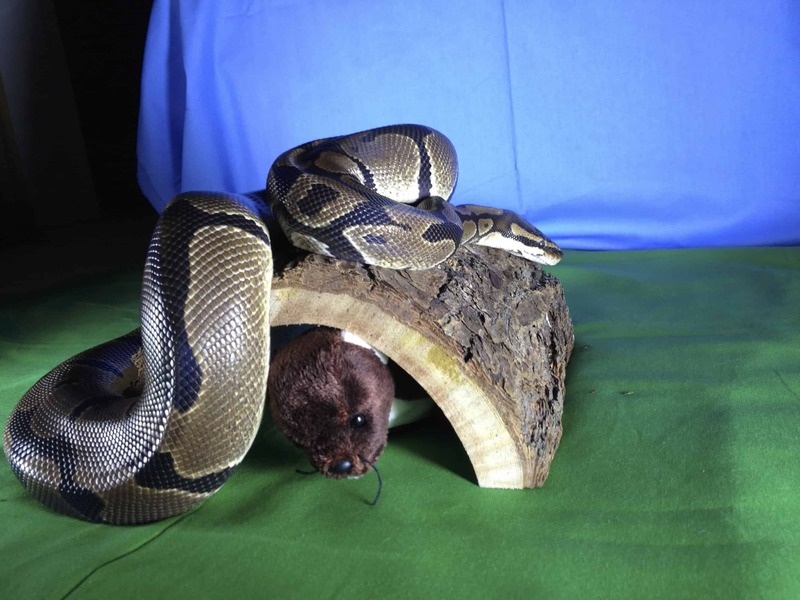 Professors often give bonus points for creative pictures! I decided to pull out some of my favorite pictures and share them with you today. In 2010, I knit a crown in Ravenclaw colors. 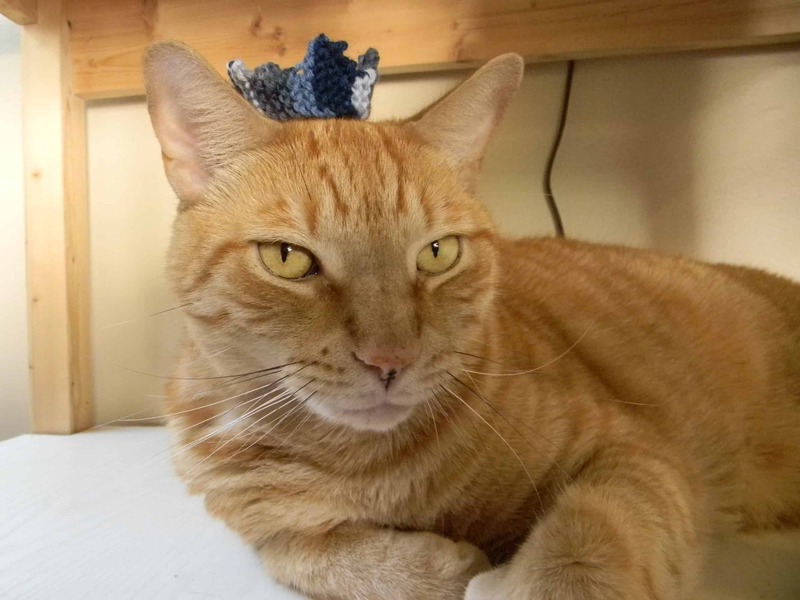 Since Tiger believes himself to be king of the house, I thought him an appropriate model. I love the look of disdain on his face. My friend Stacy gave me this skein of yarn. 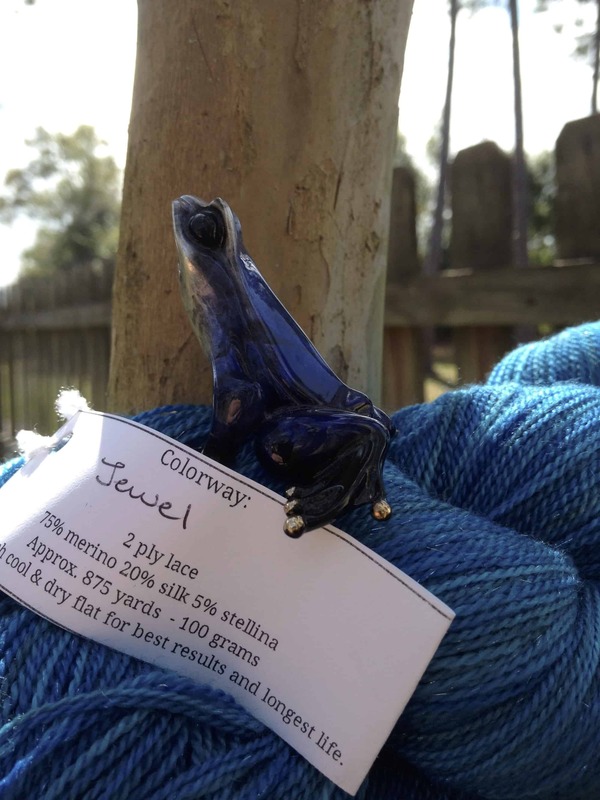 She collaborated with Christa of Nerd Girl Yarns to plan a custom colorway, based on the colors of the frog in my Ravatar at that time, and named after my imaginary magical beastie (this is a thing in Ravenclaw Tower). 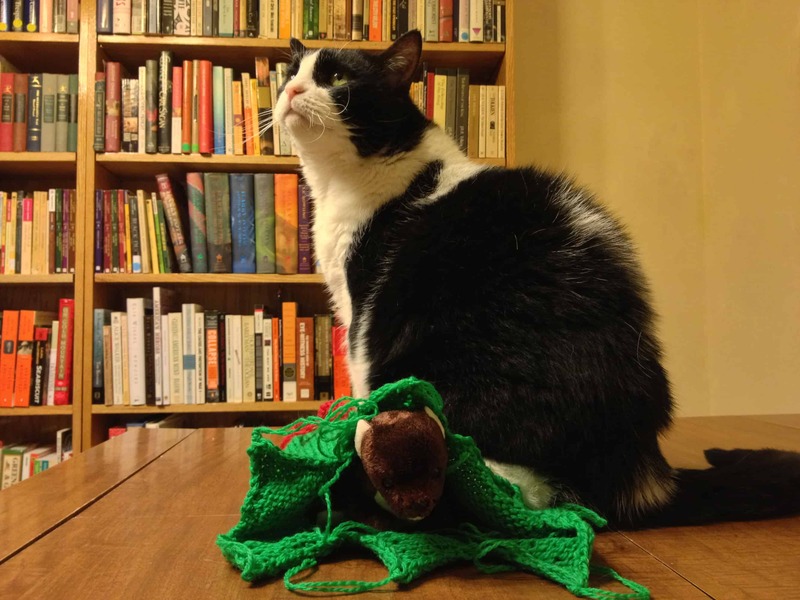 Here, I’ve posed my Frogman statue with the yarn. 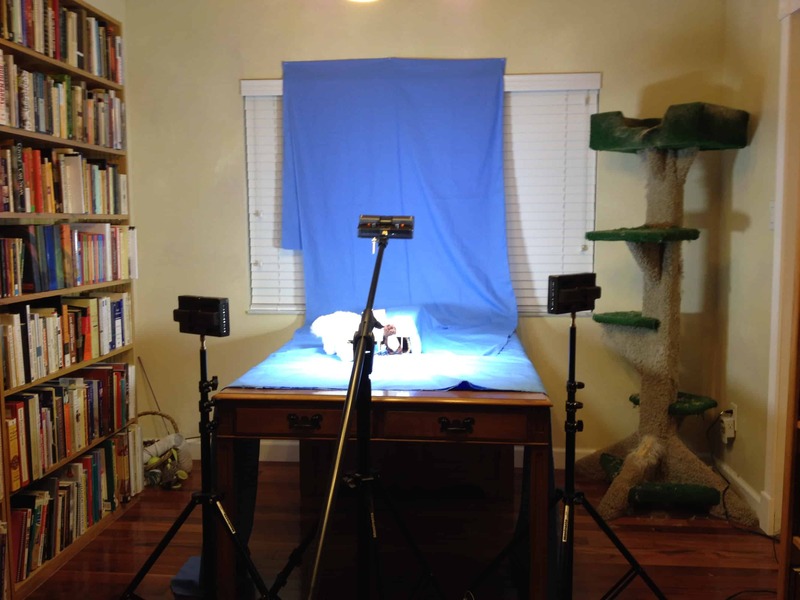 Cats often interrupt my photo shoots! 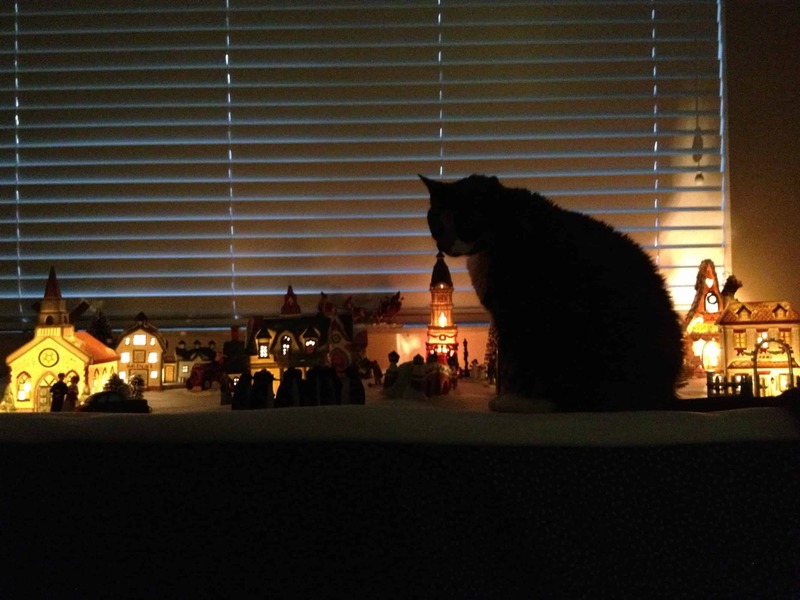 While it’s not a fibery picture, I love this photo of Pepper stalking the Christmas village. 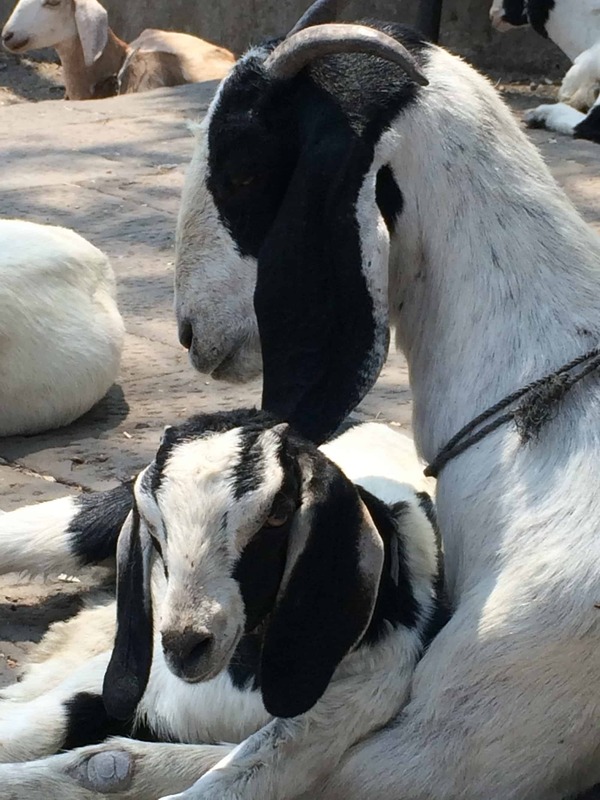 On my recent trip to India, I took this photo of goats lounging on the steps of a temple. In the fall of 2013, the Weasel of Wrath became a thing in Ravenclaw Tower. Every project I turned in that term included a picture of him and told a piece of a continuing story. The Headmistress Challenge that term was to write your own lyrics for a wrock song, with bonus points for recording it. I wrote lyrics, another member of Ravenclaw Tower recorded the vocals and instruments for me, and I put together a music video. The photos below are my favorites from that term. The Weasel wearing a sock toe hat. 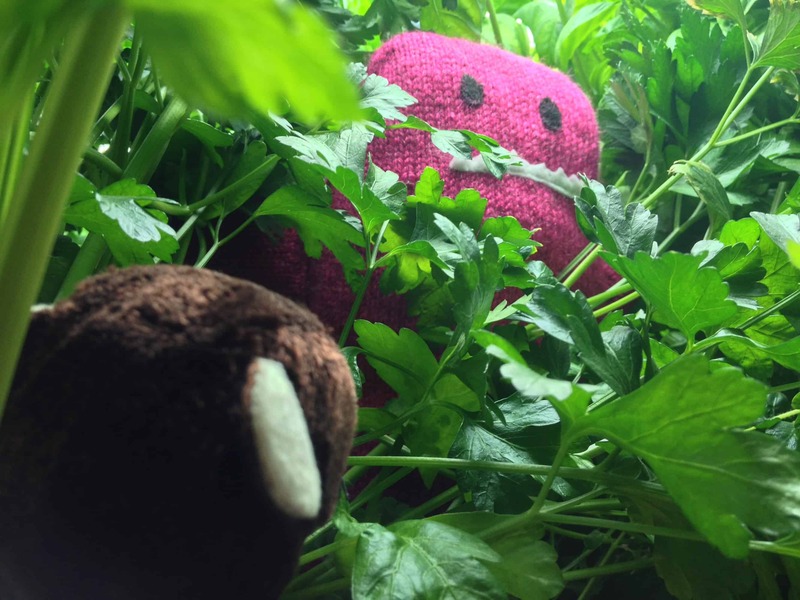 Searching in the jungle (aka our hydroponic system) for the Raspberry Monster. The wrock video included two different sets. The lyrics are about basilisks, so I went to the home of a friend who has snakes and shot stills and video there. 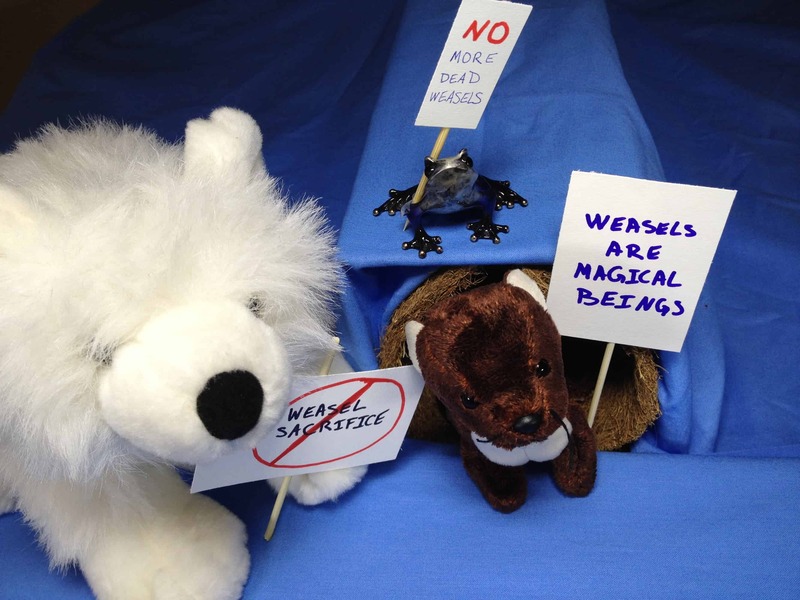 The other set was the Weasel’s burrow. 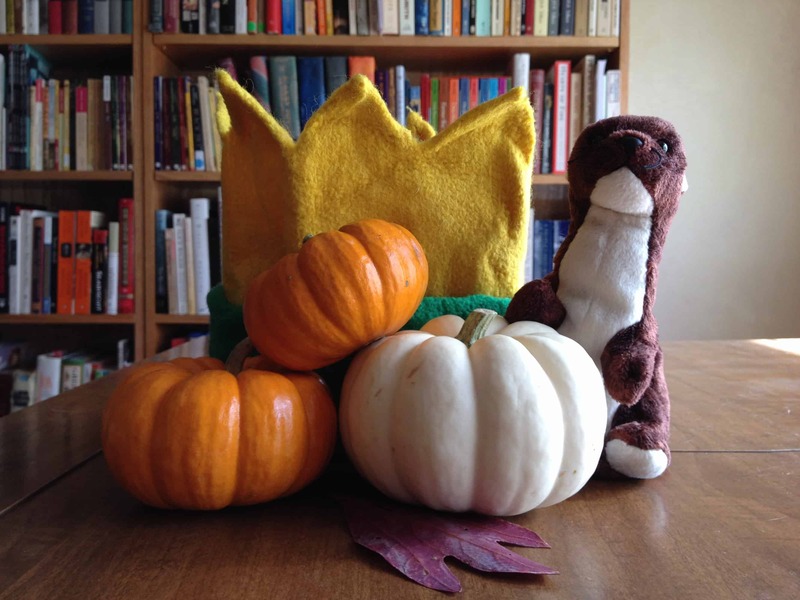 This behind the scenes shot shows the burrow set up on my dining room table. The Weasel of Wrath, with his friends Foxy and Jewel. Yesterday was a busy day around here and I did not get a chance to blog my WIPs for the week. Better late than never!